There’s an old saying that goes, “a man may work from sun to sun but a woman’s work is never done”. This is even more true in developing nations like Tanzania. Although inside the larger cities electricity and running water are available, in the villages and small towns very few homes/churches have water or electricity. Women cook over open fires outside with wood or charcoal, there are no refrigerators or modern conveniences and water is usually carried from somewhere. Recently, Tim traveled to a small village about 2 hours from Mwanza. 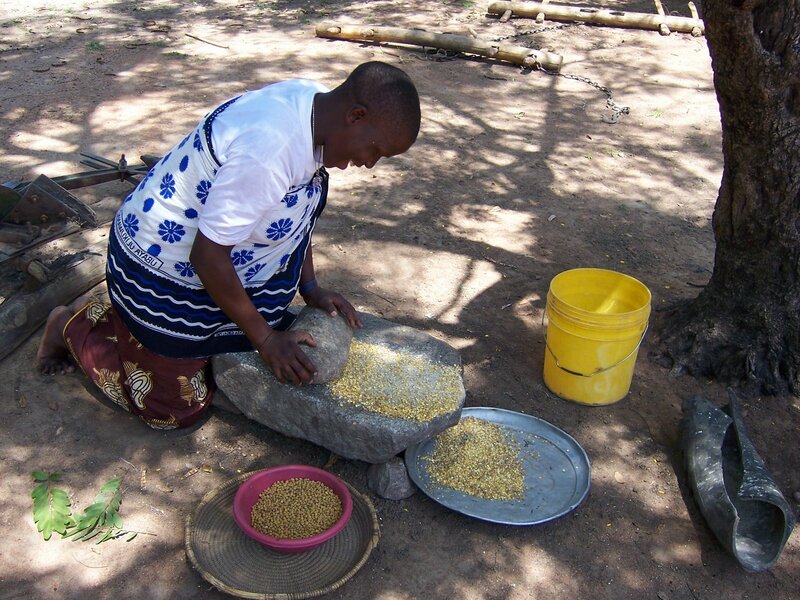 He took this picture of a lady grinding grain on stones to make flour for her family. It brings a lot of meaning to the phrase, “cooking from scratch”. For most Tanzanian women there is no such thing as “Hamburger Helper” or “packaged foods”. Women and children spend a good part of their day looking for wood, carrying water, and fixing food “from scratch” over an open fire. Think about it next time you open a can or box to prepare some food or take some meat from the freezer that is ready for cooking. Or, maybe, as you go through a drive-thru restaurant for a “quick” meal.